Actually, in relation to condominium development, Seattle is quite different from those other markets. Belltown and Downtown Seattle have reaped the bounty of new condominium development, due to high demand from employees at Amazon and other regional employers, combined with changing demographics and commuting behaviors that favor urban living, and favorable transportation investments by the City. These neighborhoods comprise the region’s premium market for condominium buyers. In 2018 Q2, seven condos in this area were sold at prices exceeding $2.0 million; five were sold between $1.5 and $2.0 million; and eleven from $1.25 to $1.5 million. 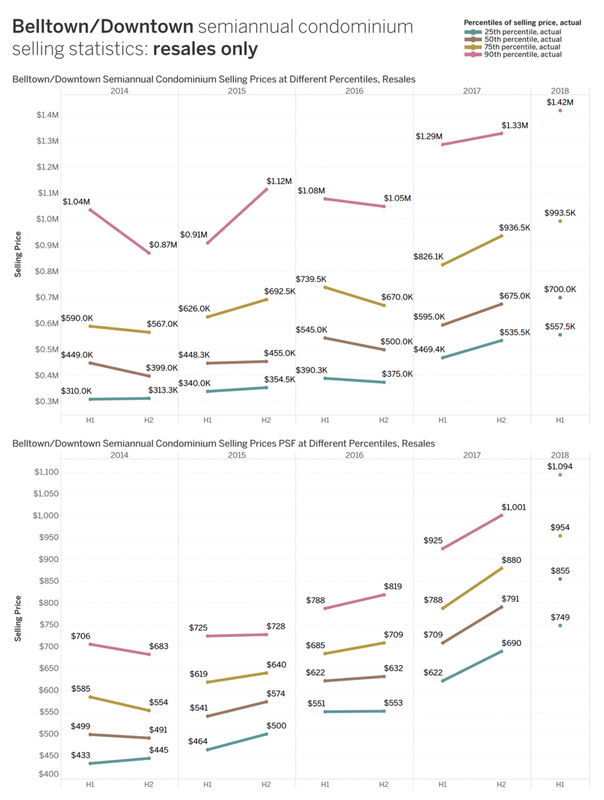 (Chart, "Selling Prices and Volumes of Belltown/Downtown and Central Seattle Condominiums Sold, 2018 Q2"). When opened for occupancy, new construction influences measures of condominium prices. In the second half of 2016, when the south tower of Insignia was occupied, resales only of condominiums sold for $500,000 and $632 per square foot at the median price, $670,000 and $709 per square foot at the 75th percentile. With Insignia included, the median price was $686,100 and $714 per square foot, while the 75th-percentile price was $1.04 million and $857 per square foot. In any case, demand is high and prices paid per square foot are rising faster than unit prices. The top one-tenth of condos sold by price in Belltown and Downtown Seattle surpassed $1,000 per square foot in the second half of 2018. (Charts, "Belltown/Downtown semiannual condominium selling statistics: resales only”).